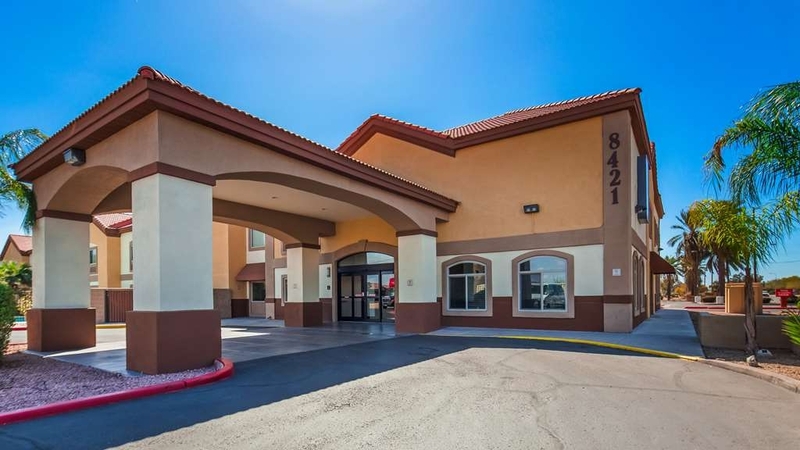 The Best Western Tolleson Hotel is ideally located in the center of Tolleson. Come and experience our hotel near the major tourist attractions. Best price guaranteed and exclusive deals. Welcome to the Best Western Tolleson Hotel! 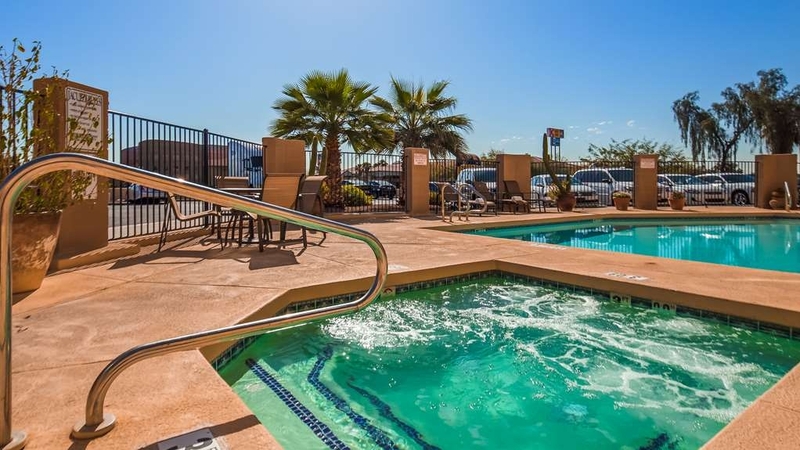 A great location with close proximity to the freeways is just one of the ways our Tolleson hotel stands out, but there's so much more to West Phoenix hotels than a prime address. Guests staying at Glendale, Arizona hotels are also conveniently close to the State Farm Stadium, making it easy to take in an exciting game. 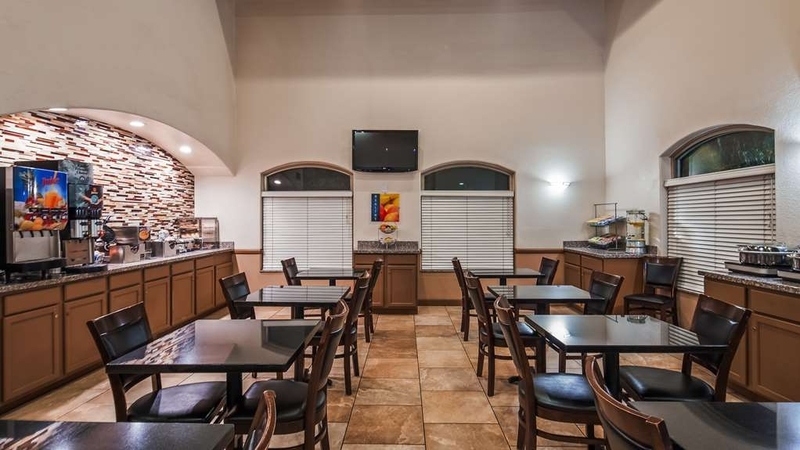 Enjoy a complimentary breakfast at this Tolleson hotel, so that every day is started on the right note no matter what you have on your itinerary. Business travelers and vacationers alike are comfortable, feeling right at home at this newly renovated hotel. With free Internet and unmatched hospitality, everything you need for a perfect trip is right here. 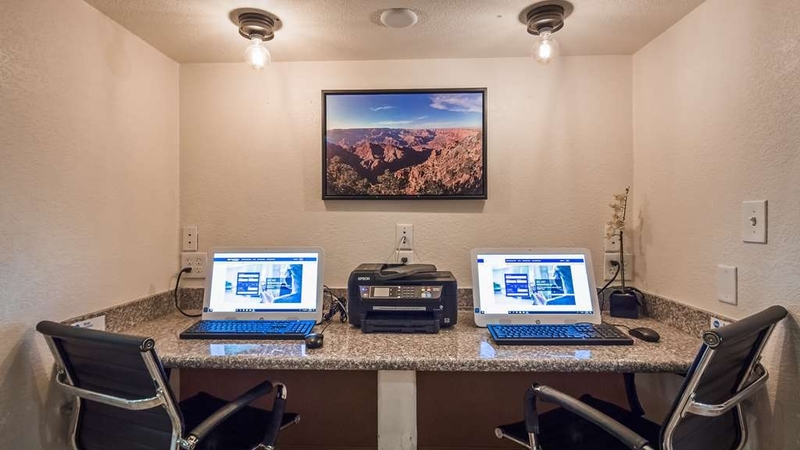 The hotel is near Westgate City Center and also a short drive from Camelback Ranch, where you can enjoy the beauty of the region with a unique outdoor experience. The Ak-Chin Pavilion, formerly the Ashley Furniture Pavilion, is also minutes away from West Phoenix hotels. Employees of Knight Transportation and other local businesses can easily make time for an event at nearby Gila River Arena, and since we're close to spring training fields for the Chicago White Sox and Kansas City Royals, it's nearly a requirement to indulge in a little fanfare. Whether it's reporting for duty at Luke Air Force Base or a family reunion that has you looking for Tolleson hotels, don't forget about the nearby Tanger Outlet Mall, because shopping is a sport in itself here. With Westgate City Center in the neighborhood and the Phoenix Coyotes Hockey games close by, there's something for everyone here. 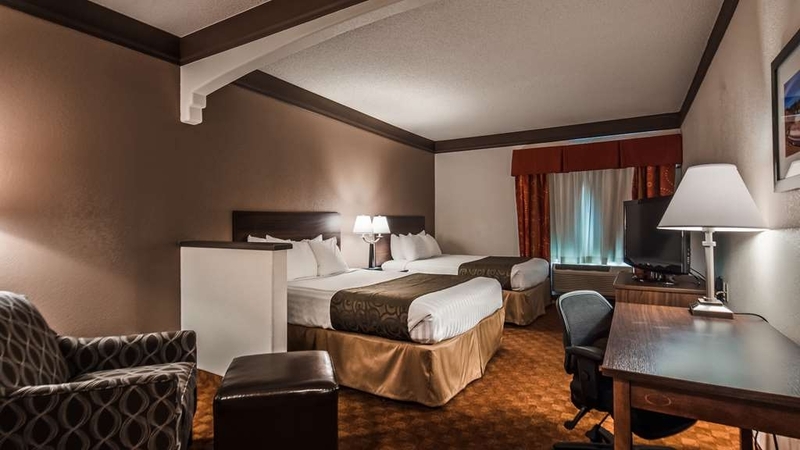 From the NASCAR races at the Phoenix International Raceway to exploring historic downtown, our Tolleson hotel and staff helps make the most of your trip. 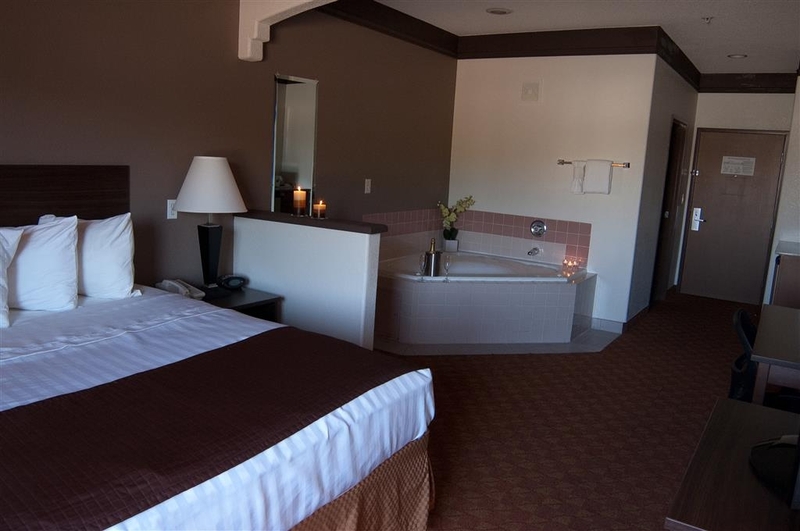 Reserve your next stay at the Best Western Tolleson Hotel and enjoy your stay in style! Very nice. Lobby and rooms were very nice and clean. Location near interstate (easy access) with restaurants and shopping nearby. Did not use free breakfast or any of their facilities as we were anxious to get home. I had no issues with this hotel. I only spent about 8hrs total in the room as it was just a room for us to sleep in after a concert in the Phoenix area. I wish Best Western was not like all the other hotels and would not gouge their regular customers when there is an event in the area. I usually try to stay in Best Western hotels but when they are charging me just as much as a higher rated hotel I will stay elsewhere next time. The hotel was very up to date. The rooms were clean and the bathrooms very nice. The outdoor pool and hot tub were crystal clear. The beds were comfortable. We plan to stay here again. It was outstanding. No complaints, staff was professional, polite and courteous. Rooms were very clean. Breakfast was very good. Price was high for the area. But overall was a nice place. Will definitely reserve another room on my next visit. We came into town to visit family, we had to extend our stay and the hotel was excellent when we made the phone call to add another night and they did it at the same rate. The hotel was in a great location easy access to everything. This Best Western Hotel was very clean, the staff was friendly and breakfast was great. Really appreciated the complimentary shuttle rides within 10 miles. The driver was very friendly and helpful. This was a great value for the room. Would definitely come back again. "Clean room, friendly staff, good breakfast"
Great value for the dollar. The Rooms were clean. Staff was friendly and very knowledgeable which was great. The breakfast was fresh and hot, with lots of options. I like how The Best Western points plan can be used in Canada and the US! "Way Stop CA To New Mexico"
Great hotel for a one night stay to break up our trip on our way from Ca to NM. Acomodating and Courteous Staff, Clean and Comfortable room. An outstanding free breakfast. We will definitely use this hotel again! Staff at this hotel is very nice. They really go above and beyond for the guests. They make you feel like youre family when staying there. Best western always has the most curteous and hospitable staff members. Some what dated in need of new bedding, but the staff here is great. Location can't be beat if you are going to a Concert at AK-Chin pavillion or to an AZ Cardinal football game at State farm stadium. Typical BW breakfast with powdered eggs and decent coffee. Great location for Ak Chin concerts. Clean rooms and friendly staff. They have a shuttle that takes you straight to the venue so there's no need to park and deal with madness. 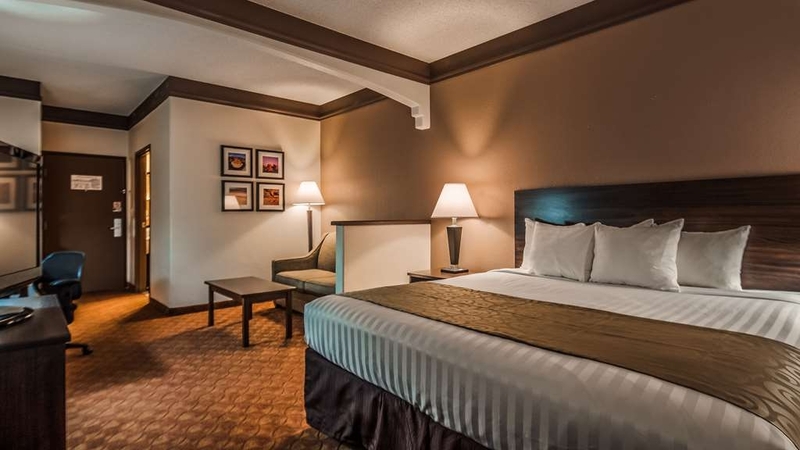 Comfortable beds and everything you need for a quick overnight stay. We stayed 4 nights as we did a hockey, football and baseball game. The hotel is ideal for the distance from the airport and stadiums. This place is CLEAN. From the lobby to the room and pool we were impressed. The customer service was super friendly and helpful. They have 2 computers and a printer for free to use the internet and to check in for our flight and print our boarding passes. Rooms were very clean and Wifi was not a problem. Rooms were quiet. The area surrounding was safe. Breakfast was ideal with eggs, bacon, sausage, waffles and all the extras. We would definitely stay here again. Very nice hotel with a free shuttle service that will take you within a 10 mile radius. The lady at the front counter went above and beyond to help with anything I asked and the shuttle driver was awesome as well! Great service and room! Had a very enjoyable stay. Was able to book the room on line and upgrade with my points. Breakfast was very good and a friendly staff made it that much more enjoyable. Highly recommended! 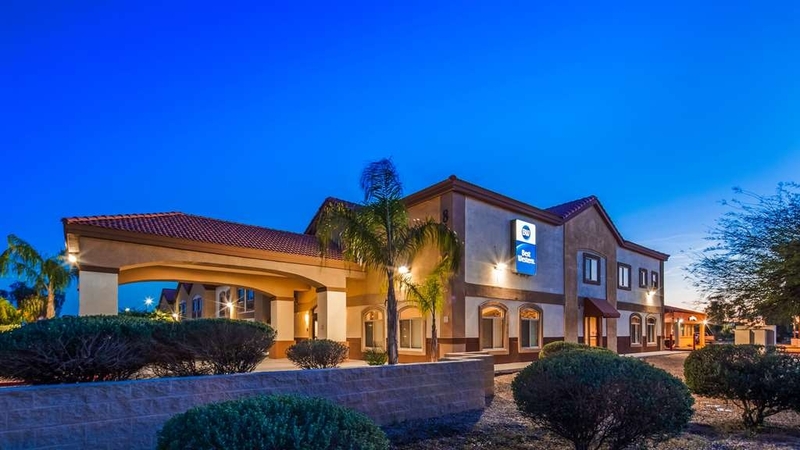 Best Western Tolleson has been an excellent hotel that I have stayed with for a number of years .The staff has always been very polite and helpful if I ever had any questions of concerns. Always a great stay with them. Nice stay. Clean room and grounds, and the staff was very helpful. It is very close to the freeway and food and entertainment venues. WiFi was strong and the pool area looked very clean and well taken care of. Rooms were clean. The restroom was well stocked with shampoo, conditioner, and body wash. Lots of parking.. Nice lobby. Breakfast was OK. All staff encountered were really nice. The property is not too far off the highway but it wasn't noisy. Sleep was good. Beds were comfortable. In room fridge and microwave was nice. We didnt use but thought that was a nice amenity. "A good value Best Western when in the area"
Clean, nice people, decor is a little dated, but it's a good value for the price. An excellent choice for people attending an event at the Ak-Chin Pavilion!! Within very easy walking distance. Close to I-10. Nice hot breakfast too. "Very Well Run Hotel! " I stayed here after my semi truck had engine trouble and needed to be towed in for repairs. I was very impressed with the friendliness of every employee I interacted with at this hotel- front desk, maintenance, shuttle van drivers, and maid staff- if you get to read this all of you are winners in my eyes! The room was well appointed and in a quiet location. The outdoor pool and hot tub was definitely what I needed to relax after dealing with everything going on. Heads up: The parking lot is tight and not suitable for any bus, motor home, or a vehicle pulling a trailer. There is another hotel across the street that has parking for trucks and larger vehicles though. I would definitely recommend this hotel to anyone needing a place to stay that has clean, comfortable accommodations! Thank you for the kind words. I am glad everyone made you feel welcomed and comfortable while you were here with us. We hope you will stay with us again in the future if you are back in the area. Safe travels to you! Excellent customer service breakfast was good-great parking the staff here are professional and so willing to help and are friendly! We wish that more places had customer service and people like the workers here! Keep up the great job ! We enjoyed our stay here. It was a Quick and Easy Check In and Check Out! The room was very clean and comfortable. The staff were friendly and courteous. We enjoyed the morning breakfast as well. Quick access to the freeway. The Best Western provided very comfortable and quiet stay. I have stayed at this hotel numerous times for business and never had an issue. I always check there for a room before looking elsewhere if they are full. Nice hotel, clean rooms and amenities. Staff is friendly and helpful. Easy access to the freeway. Only drawback is the small breakfast area, not enough room when busy. I have stayed here twice and will again in the future. "Excellent and clean. Really Good Value"
Great Beds, clean room, friendly staff and a nice breakfast. Good Location on the West end of the Valley. Super Value. I have paid much more for much less. I will certainly stay here again on my next business trip to the Phoenix area . Very pleased staying here. We we're in town for a hockey game at Hilarious arena, as well as several spring training games. The location was great- just off I 10 and made for easy travels to all. Complimentary shuttle in the afternoons/evenings took us to Gila arena. He will take you within a 10 mile radius of hotel. Free breakfast in the am was very good- lots of different options. Beds were comfortable, rooms were spacious and quiet. I will definitely stay here again when in the area! "The AC did not work at all I was up all night sweating. Also the TV did not work it was not the remote tried unplugging"
The AC did not work they had no cooling and I was up sweating all night. This made my experience horrible. Not to mention the TV did not work and it was not the remote that was the issue. When I told the staff in the morning they really acted like they didn't care. I couldn't have been more pleased with this hotel. The rooms were clean and maid service was excellent, and the breakfast was great. Lots of hot foods and good variety. Location was very convenient to major Phoenix thoroughfares. Would definitely recommend. "Located Right Next to I-10 Freeway = No Sleep"
This hotel was average. We have stayed in several Best Westerns in different states. This one, due to the location so close to the freeway was not one that I would return to. The car traffic was extremely loud. My husband had to turn the fan on high to try to drown out the noise. It helped a bit but not enough for a restful sleep. The room was well maintained with modern decor. Our check in went well even though the Front Desk lady said that this was her 3rd day on the job. She did great. We loved that they offered a shuttle to anywhere with in a 10 mile radius. The driver was very friendly and nice to talk to about the area as he drove us to a restaurant. The breakfast had the usual items available. Other BW hotels offer more selections of hot meals but this one was adequate. There was a small pool and Jacuzzi to use but we opted not to go in. We were here for the Spring training games. It was an easy commute to the Goodyear Ball park which was about 15 minutes away. I had to make a quick trip to the area and needed a quiet place to stay. This hotel fit the bill. My room was very clean and quiet and huge. If had needed to stay for extended amount of time, the room would have been a great place to work, except for the WIFI. The wifi was very slow. Other than that a very clean and quiet place. "A night at Tolleson Az Best Western Hotel"
Nice place to stay, polite and helpful staff. Breakfast was good and good location easy to find off the freeway. Would stay again at the Best Western in Tolleson Az. Only downside was not a lot of restaurants within walking distance to choose from. Very friendly staff!! Rooms and commons areas were all clean and bright. Breakfast was a good variety of options. Pool area was well kept and clean too! Pillows were a little on the small side. Would recommend! My place away from Home...The staff welcomes you without hesitation you will be well taken care of while you stay . Rooms are always clean and beds are very comfortable . They offer you a great breakfast also ! My wife had to come to Phoenix for surgery and we booked with Best Western because of the very nice upgrading and pricing. The Best Western was comfortable, clean and in a safe area. It was also in a very convenient and close approximation to the hospital my wife was in. Room was spacious and clean. Breakfast was good. Staff was friendly. Only negatives were the internet was a little slow and bathroom could be updated. The location was good for us as we were visiting family. We would definitely stay there again. My parents live in Glendale AZ. and we visit at least once a month for 4-6 days. So we have stayed in a great deal of the hotels around the Phoenix area as close to where they live. This one is the only one I choose to return to. We love the staff. They are always polite and helpful. The hotel is clean and quite. The items they over for breakfast is more then sufficient. We were looking for a hotel late at night and came upon this Best Western. The hotel is immaculate staff was awesome. They were polite and efficient. The rooms were super nice very comfy beds and roomy. Would highly recommend. Free breakfast in the morning was a nice add. Great location near many places to shop, dine, and sports venues. Clean rooms and good value for the money. Accommodating staff. Have stayed here many times and will continue to do so. Breakfast bar atypical that others offer. "Would stay at this hotel again." Hotel was clean. Room was neat and fairly clean. Rug in room had drops of whatever was spilled, which could be easily cleaned with a brush and water. Mattress & pillows were comfortable. Not much outside noise. Able to sleep except for a car alarm going off and people talking for a short while. Breakfast had a variety of items. Husband said the eggs tasted like they were from powder and the bacon was overcooked. There was cold and hot cereal, yogurt, hard-boiled eggs, variety of breads, juices & coffee, and fruit. The waffles were tasty. Staff were courteous. "very rude staff, manager, and general manager. very unprofessional." "Multiple problems and incompetent staff"
When we arrived in the room we discovered that there were ceiling lights in the entry and bathroom. We realized after we went to bed that if either got up to use the bathroom, bright lights would turn on. I called the front desk asking how to disable the automatic function. I was told to push a certain button. It did not work. So... we spent the night waking each other up. Next was shower time. By the second shower, the temperature and pressure of the water went way down. Nothing like a cold shower! Breakfast was sparse at best. We had to wait. 10 minutes for food to be restocked. Then, pinchers were not provided for the bacon and sausage, so people were using their fingers to remove the meats from the serving dish. Ewwwww! We will definitely avoid this hotel! I have stayed at this Beet Western approximately 8-10 times over the past 9 months. 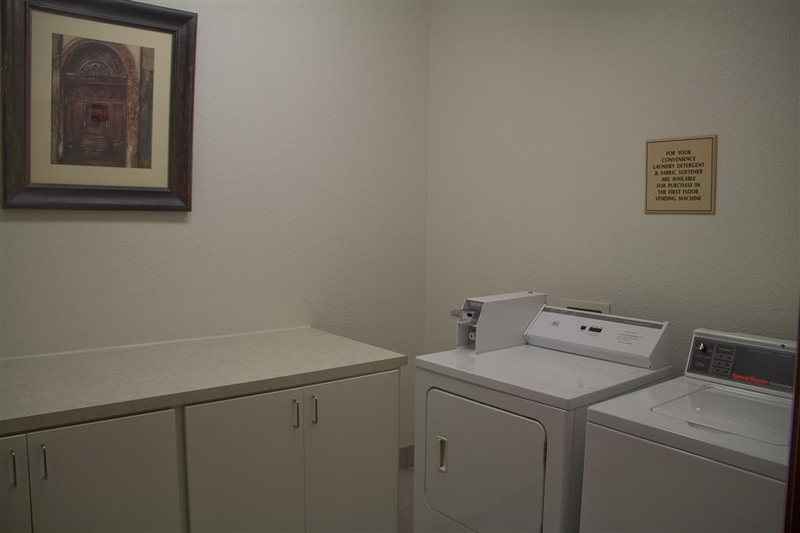 The staff are extremely friendly and helpful, and the entire facility is always clean. Lots of options for the free breakfast as well. We have stayed here multiple times when attending a concert at Ak-Chin Pavilion and you can't beat the location and value of this place. Spacious, clean rooms and an outstanding free breakfast. We will definitely use this hotel again! "Tou get what you get"
I called and made a reservation for a bottom floor room. I explained to the clerk that I was speaking to that I am handicapped. I was asked if I needed a handicapped room. I explain as long I was on the bottom floor I wouldn't need one. I received my confirmation and it stated a bottom room. I called two days prior and again was told that i would have a bottom floor room since that is on my confirmation. When I arrived I was told I am on the second floor. I asked about a bottom floor and I was told 2 days prior. The desk clerk told me they were all taken. Either I could have the 2nd floor and go someplace else. I was forced to walk the entire distance of the hotel since the door by the elevator was not working and then walk the entire distance of the hotel again becasue my room was just above the lobby. I called the corporate office and was told that I should have received a bottom floor room since I used my credit card and was given a confirmation twice that I needed a ground floor. The corp. office refused to help. I had to go to my vehicle later than night and there was a car parked in the handicapped parking without the proper plate or placard. When I asked the desk clerk about it he went and moved the car since it was his. After this experience I will not be giving Best Western my business and more. Close to a lot of amenities. This hotel is close to freeway and to many different restaurants. It is withing walking distance to Ak-Chin stadium. It does have a convenient shuttle that can take you to different locations. ""Great for concerts @ ak chin pavilion""
We stayed at this hotel this past weekend to watch the Sam Hunt concert. At first I was a little hesitant because I had never been to Tollison and didn't know what to expect.. I seriously considered staying in Phoenix and taking the drive back and forth the night of the concert, but I'm so glad I didn't. I booked them Brew many months in advance, and did a little research on the property that review seemed good so I decided this was where we were going to stay, because it is so close to the concert Pavilion. Even before checking in Bella at the front desk was great I had called two weeks prior and noticed that the room rate had dropped in price. Bella adjusted the price for me, and was very efficient and friendly in doing so. We arrived at the property it is a smaller hotel but very nice.. I could tell that the building was older but the rooms were renovated and really nice for the price. When I checked in at the front desk I was greeted by Bella, she was completely awesome she checked us in, gave us directions to some restaurants near us, and also gave us some pointers on the shuttle, as well as the concert venue.. she made check in as easy as it could have been. My kids decided to swim 10 minutes into checking in the pool was very clean and well maintained, they had a great time swimming throughout the weekend. Breakfast was great as well this property carried eggs, bacon, sausage, potatoes, pastries, oatmeal, waffles pancakes a really great variety and very clean and very well-kept. I gave this hotel a 5-star rating and factored in amenities, cleanliness, as well as price. The property was great for a concert the shuttle took us to The Venue, and it was about a 10-minute walk back and well-lit areas to the hotel. I can't say enough how great Bella was, she was so friendly with me as well as my fiance, and my kids I wish every Hotel had a Bella to make life easier when traveling.. Thank you Bella and Best Western for making it a great weekend for me and my family, if I return to Tollison I definitely 100% will be staying at this property.. Check in is at 2:00pm. Arrived shortly before 3:00, had a short wait to check-in. Our room was not cleaned. Had to wait for another 45 minutes after checking back in with the front desk. Was told because I made my reservations on-line and so far in advanced (a month and a half), and that they were booked, there was nothing they could do for me as far as any reimbersement for the long wait. They could send us to another location, again, taking our time away from us. We were in town for a huge, sold out concert. We knew how much time we had and had planned for extra time, but not that much. Thank you for your review. I'm sorry you found some trouble with the check-in process, and we apologize for any inconvenience. I have already communicated with you regarding this matter via private email to attempt to resolve the matter. "Place to stay near the Stadium"
This hotel is very conveniently located. 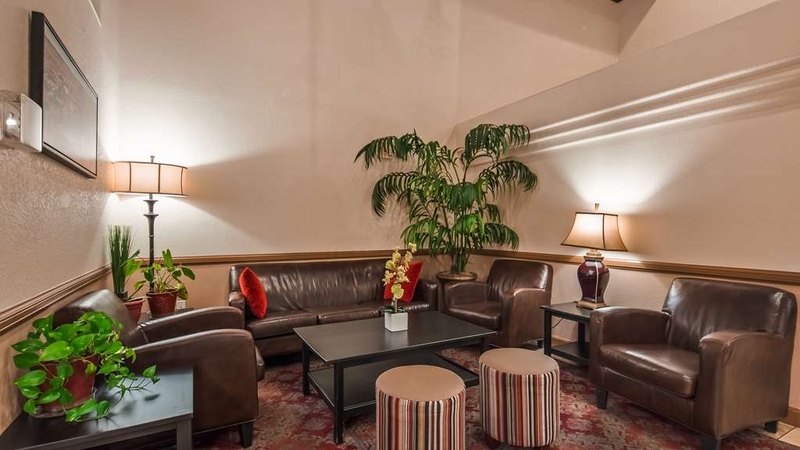 We come up to Phoenix for concerts and events and we like to stay here at the Best Western. The pool is great and the hot tub is nice when it's working. Great crew, lots of fun. Hotel is under renovation however there is a musky smell in the entire building, well at least in my room, the hall ways and stairwells. Internet was absolutely horrible in the room. Staff was helpful and friendly. "Great staff could use small improvements"
Overall we had a great stay. The pool was really dirty but that's really our only complaint love that they allow pets! Sad to say all the staff was very friendly and helpful except for the manager. There are places to eat within walking distance and right next to the hotel is an adult store that is a must check out definitely in the top five my wife and I have been to. Thank you for your review! I'm glad you enjoyed your stay at our hotel. I'm sorry that you believed the pool was too dirty. Admittedly, it took a few days for our pool to recover from the monsoon storm that affected us. I apologize that you felt that a manager wasn't helpful or friendly, however I am glad that our location was convenient to your purposes! I look forward to your future visits. Friendly staff. Very clean rooms stocked with everything you need. Working Pool and hot tub. Good breakfast. I have stayed in many hotels in the greater Phoenix as close to my parents house in Glendale. This one has been the best. No full time residents. It is where I try to reserve a room every time we go up there. But it fills up fast when there is an event in town. Which happens a lot. Thanks for your good review! I'm pleased that the guest room was perfect for your needs, and was in a great location. We're a prime location for events at Ak-Chin Pavilion, University of Phoenix Stadium, Gila River Arena, and Phoenix International Raceway, among others. We look forward to seeing you again, and thank you again for your review! Stayed one night here while attending a concert at Ak Chin Pavillion. I suppose technically, the hotel is walking distance to the venue because we did walk, but in retrospect, I do not feel that it is safe to do so. We ended up getting Uber back to the hotel after the show. Not a huge deal. But that night and the next morning there seemed to be quite a few unsavory characters lurking around. That, I did not like at all. On the inside, the room was fine. It was large and reasonably quiet. Staff was polite and helpful at check-in. No complaints there at all. Even with that, I would stay again. Area is too questionable with even more questionable clientele. Thank you for your review! Our hotel is a 15-minute walk from Ak-Chin Pavilion. We do offer drop-off service for concert events, but we're unable to provide pick-up from the Pavilion after concerts. 83rd Ave. and McDowell Rd. are both well-lit streets, and there is only one intersection to cross. Part of having a comfortable stay at a hotel is knowing that you feel secure, and we take that seriously. Our hotel cooperates with our neighboring businesses and the Tolleson City Police Department to reduce and prevent crime, especially during busy events. Best Western Hotel in Phoenix Arizona. 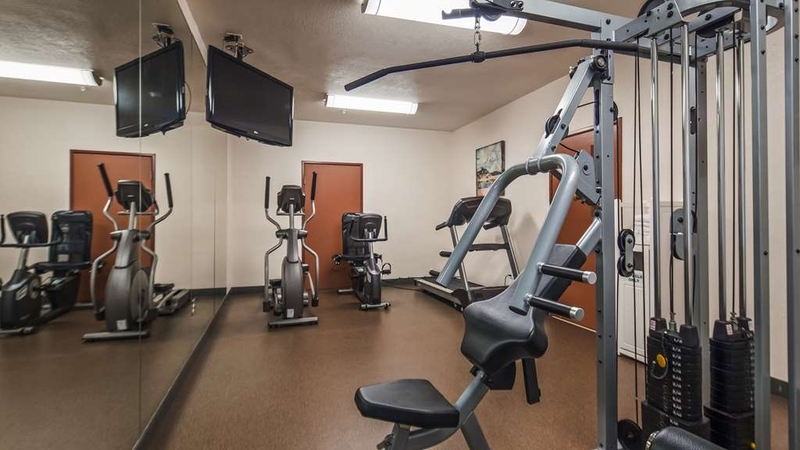 I truly appreciate all the helpful staff as well as the amenities provided ( which are included in the price) with a family of 5, it is wonderful to get that extra cost savings. Thank you for those kind words! I'm so happy that my team made your stay so enjoyable, and that you were able to avail yourself of everything our hotel has to offer. I look forward to the next time you stop by! Thank you for your great review! I'm glad you had a great time at the concert, and I'm happy that our hotel was able to accommodate you so well during your stay! Thank you for your wonderful review! I'm so glad that our team was so helpful to you even while you were feeling a bit uncomfortable. I really believe that these sort of interactions are what a hotel should be about. Thanks again, and I hope to see you on your future stays with us! I have stayed at this Best Western many times because it is walking distance to the Ak-Chen Theater where I see many concerts. This visit was very different from my last visits at this Best Western and any Best Western I have stayed at. First Marcel at the front desk was fast and effective with our check in. We were upgraded because I am part of the Best Western Rewards program. Our room was a typical Best Western. It was clean and the bed was comfy. But the breakfast... My husband are on a special diet that limits the foods we eat. I explained to Cody, the employee in the breakfast area, what our situation was and he offered to cook us scrambled eggs with no cheese or butter. I was shocked. I have never been treated this special traveling in the US. The eggs were great. The customer service at the hotel is amazing. I was ecstatic to read your review. It's wonderful to know that my team went above and beyond your expectations. I'll be sure to pass along your compliments to them! "Good hotel for a business trip"
No extra frills but a good clean hotel for a business trip. Stayed here while visiting a distribution center for a couple of days. Not a very walk-able part of town but you are a short Uber ride from a lot of restaurants in the area. I appreciate your review, and I'm glad you had a good stay with us. I'd like to also point out that we have a free shuttle within a 10-mile radius, which includes all those area restaurants. I hope that next time you stay with us, you'll take advantage of it! Thanks again! "Poor Customer Service . Looking for pet friendly look elsewhere"
Booked this hotel because it was pet friendly and it was a Best Western, which I am a member of and have had great experiences with up until now. Upon check in the representative who checked us in did not go over the pet policy nor did the verify a number in the event they needed to reach us. The only thing they mentioned was it will be a 25 fee. I was out of my room for 4 hrs to attend my college graduation and was gone for 4 hrs. I was told when I returned that I needed to leave because my dog had been barking the whole time and they had to move 2 people, and refund one person. He said he would be charging me $100 since they had to refund someone else. I was completely humiliated. My 5 lb dog was in his kennel in the restroom when I left. No one ever told us we couldn't leave our dog. I have stayed with my dog several times and have left my dog for a short periods of time in other Best Westerns and have never had an issue. We left the hotel one day early and traveled back home which is 6 hrs away. We were not even at the hotel a full 24 hrs, more like 16 hrs. I called customer service the following day to voice my complaint and was told that they will put in my complaint to management and someone will get back to me with in 7 days. 7 days passed no call, which is also frustrating. I called a week and 3 days later and the representative read me verbatim what the managers response was. There were two things that stood out in the response other than they weren't going to compensate me for the 100 fee. In the response it stated they had to move 4 people and refund one person yet when the manager talked to me face to face he said they had to move 2 people and refund one. Also, the response said my dog had been barking for 6 hours, yet I was gone 4 hrs. The also told me at customer service that there was nothing they could do, so I had to talk directly with the GM at that hotel. I did call and speak with the GM and he said he would not refund me any type of fee. I asked him how come his employees do not review the pet policy at check in and do not verify phone numbers on file he said they do not do that. I also asked him how come I didn't get a copy of what I signed at check in, he stated we don't have to give guest that, we keep that for our records for legal purposes. I asked if I could read the pet policy online for their hotel, he said its not online. This has been very frustrating to say the least, I will no longer be staying with BW again and will pass the word on. If I would of known, I wouldn't of stayed here. Thank you for your review. You bring to light an important part of staying at a hotel with a pet. We are a pet-friendly hotel. We charge $25.00 for each pet, up to two. Our pet policy, which is similar to many other hotels, states that pets should not be left in the room alone, namely because of the possibility of noise disturbance. When other guests are disturbed by a barking dog, and we cannot contact the owner of the pet for hours, those guests want to be relocated or refunded or both. Since your pet was the cause of a disturbance of this nature, we needed to take appropriate action for the sake of all of our guests. Being a pet owner myself, I feel very sorry for the dog who is left kenneled in the bathroom by himself on a regular basis in hotels. It certainly wasn't his fault that things turned out the way they did. Great location for catching a show at Ak Chin pavilion. Shuttle was able to take us to the show. And also got us to west gate. I would plan this trip again. Great staff, very friendly and accommodating. Thank you for your wonderful review! I'm very pleased that we were able to accommodate you so well. At about half a mile away from Ak-Chin Pavilion, we provide drop-off service to the venue. "Best Western Tolleson Hotel (Phoenix area)"
Very nice, relatively small hotel in the west part of the greater Phoenix area. Lots of dining in the area helped to make our stay enjoyable. Staff was friendly and room was very comfortable. we had a king bed with very spacious bathroom. Relatively small hotel allowed easy access to the room. Breakfast was very good. Thank you for your spectacular review! I'm glad that we were able to make your stay so memorable. I'd like to also mention that we offer a complimentary shuttle within a 10-mile radius should you want to wine-and-dine! The hotel was relaxing. The staff was great and very helpful. Only thing that i was upset about was my room was not cleaned unless i stopped housekeeping and asked. Last day/night, They didn't make beds or take out trash. I didnt get any clean towels. Thank you for your review. I invite you to contact the hotel directly so we can verify your stay information to determine why your housekeeping service wasn't what you expected. "Staff where simply amazing and very efficient, they all knew what they were doing..."
It's really great to read that my team made your stay so enjoyable. Thank you so much for the wonderful review! Perfect location if attending an event (e.g., the Final Four as we did) at the University of Phoenix Arena. Also close-by shopping for an out-of-towner and easy access to major highways. Facility well-maintained with a decent breakfast. I appreciate your taking the time to review us! I'm glad you enjoyed our hotel for its location and breakfast. I look forward to your future stays! The hotel was clean and the staff was very friendly. However, there was some cracked tile in the bathroom and the door towel hanger fell off while trying to hang up a towel. Also, the shower knob was a bit loose and there was no true 'stop' to turn the water off. Overall, it was a nice stay for me and my friends. Thank you for your review! I'm sorry you had difficulty with the working order of the bathroom. We're about to get started on a renovation project that includes work on the bathrooms. Next time you stay with us, I hope that you'll notice the difference! Great location 20 to 30 min away from all minor league stadiums . Big room with a couch. Breakfast 6am to 10am . Everyone at the Hotel is so friendly and so very helpful. Hotel is very kid friendly. Plenty of restaurant walking distance . Will be back next year . Thank you for your great review! I'm glad that our convenient location and our wonderful team were able to make your stay so enjoyable. I look forward to your future visits! Staff is always welcoming and helpful. We enjoy staying at this hotel. Easy access to our planned events. Our room is always clean and comfortable. We always have a hassle free stay. I recommend this hotel to anyone in the area. I appreciate you kind review. I'm glad that my team was able to make your stay enjoyable and that you found our location convenient. Thank you so much! I'd really like to say thank you to this hotel, cause I had great and peaceful vacation here at Arizona. The Staff was friendly and very acommodating to their clients especially to me when I was check in. So guys ifo you want perfect hotel vacatio I recommend this pace to you. It's wonderful to read that your stay here was so quiet and restful. I'm so happy to know that my team was able to accommodate you so well. I slept here under the name of Chancho, really bad service. Many hookers in the lobby. The wifi Is not free. I prefer sleeping at the Circle next door with my buddy Gary the snail. But a beds a bed right. Stayed here for two nights as the hotels closer to the stadium were booked with conventions. Came down for a Cardinals game Uber ride up there $13 and home $29. Front desk was great we got there early was very hot got us in early so we enjoyed the pool and left for the night,morning breakfast was disgusting seriously go somewhere else probably worse I have ever had, bagels frozen still, gravy cold everything tastes old and stale was terrible. You are not close to the stadium as they say but lots of fans were there no transportation for any of us seemed odd considering every other hotel has a shuttle to the games. "Average hotel - Interstate 10 noise"
We stayed here last month to attend a concert at Ak Chin Pavilion, which is just down the street about 1.5 miles. The hotel is one block off Interstate 10 which makes for a lot of noise at night. We were on the first floor and our room overlooked the dumpster which was picked up at about 4:15 the next morning. The room was large, king bed, huge bath tub and a work desk. There was a mini fridge and a coffee pot. Breakfast in the lobby was just fruit, coffee, yogurt and cereal, nothing hot like eggs. They have a swimming pool but we did not use it. Overall, I do not think I would stay here again because of the noise. "Very good stay, great value!" Stayed here after a nearby concert. Upon check in, we were greeted by very friendly staff, and a clean, well arranged front room//breakfast/lobby area. We found out that many of the other guests were there for the concert as well, and that they would be offering free shuttle rides to the venue. Great service! There is only one elevator, at the opposite end of the hotel from the front counter, but that's ok....we took the nearby stairs. No worries. The entire interior of the building was tidy and well kept. Our room was exceptional for the price paid....very tidy, clean and well appointed; with a mini-fridge with freezer, coffee machine with coffees and all the accoutrements, and a microwave. The bathroom was clean and bright. We had two queen sized beds, and they still managed to fit a table, chairs, small desk, and a small sitting couch without it feeling cramped. The TV was of good quality - a LCD flat panel of decent size, yet the Cox basic cable was hugely disappointing, mostly because of the low resolution picture on the high resolution TV. After getting settled, we hit the pool, which was crystal clear and well maintained. The rest of the stay after drinks/the concert was a blur... I would definitely stay here again. Avoid the place behind it....I wrote a review for them as well. Nice friendly people but room is a glorified roadside motel 6, and not a nice motel 6 lol. I stayed at a holiday inn the night before and it was great. 10 dollars less got me a dive, smoke smelling motel. "Staff was great! No issues at all with them"
This hotel was higher price than Prescott and Goodyear. It didn't have as good a breakfast as the other 2 hotels had scrambled eggs and sausage. The rooms were alright, however the Prescottonian and Goodyear hotels seemed cleaner and more up to date. Thanks for your review and the breakfast advice! Clean room, friendly staff,will definitely stay here again! We were visiting to meet my sister who only lives a mile away. Though there were cheaper rooms at hotel next door, but this hotel was a better option for us. Thanks for your response! 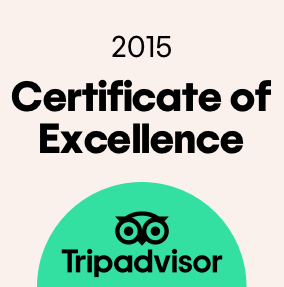 We're proud of our hotel and try to keep the best standards. We look forward to your future visits! We appreciate your comments! We'll see you again sometime! "Hotel almost 100...but NO POOL (out of service usually)"
We're sorry you were unable to use the pool. Our regular pool hours are from 9:00 a.m. - 10:00 p.m. In accordance with our posted pool rules, we reserve the right to close the pool at any time. During your stay we closed the pool 2 hours early because guests were creating an unsafe situation. Our guests' safety is our primary concern, so we acted on the occurrence. We stayed here a week during Spring Training in March, 2016. The hotel is old and located away from most restaurants and stores. There are a couple of fast food places about a block away and a Sam's Club across the street. The best thing about the location was its proximity to the freeway. Our room was on the second floor, located above the swimming pool. From the moment we arrived, there was loud music and partying going on at the pool and the front desk did little to intervene. We asked to be moved to another room and were given a room smelling like an ashtray. Front desk said that couldn't be, since they were a nonsmoking hotel. After checking it, they told us there wasn't another room available until later. We decided to stay in the first room after we were given assurances the music and partying would be curtailed. The hotel is old and dated and in need of a remodel. The beds and pillows were just okay. WiFi was free, but spotty and weak at times. The breakfast buffet was not desirable, but the staff was great and made an effort to keep it clean and stocked with fresh food. We would not stay here again and would not recommend it. We're sorry to hear about your stay in March 2016. We'd like to assure you that we are under new ownership and new management. Your input to help us improve our hotel is very important to us. We hope that you'll give us a second chance! Quality hotel for a good value. The staff is great, the hotel is clean and in a very decent part of town. Lot's of food around and a Sam's club across the street. Very good experience. Will be back there again and again. Thank you for your comments! I agree that we have a great team here at the Best Western Tolleson. We'll see you again! "Great location for AK Chin Pavillion"
My husband and I stayed here for the last two nights. It's in a great location for concerts, restaurants and shopping. The receptionist Evie was very helpful and printed out maps for me. The hotel is a little tired and dated looking. Our room smelt of stale smoke but it had good ac. We didn't try the breakfast. Complimentary tea and coffee available all day. "Ak Chin Pavilion Concert Hotel"
We selected this Best Western because we were going to a concert at Ak Chin Pavilion in Tolleson, Az and it is one of the closest to the venue. They offer a shuttle to the concert. We walked back because the area police are giving the hotel shuttles a difficult time to return to pick up guests. The walk back was fine, a mile or so. Good location for our purposes. "Good Stay for the Races"
We were spending a weekend going to Phoenix International Raceway. All the hotels in Avondale were full so we came here and we were happy we did. The hotel was very comfortable and only 15 minutes away from the Racetrack (when there was no race traffic) The hotel is close (but not walking close) to many restaurants. The breakfast was typical hotel continental but we were happy with it. The fitness room was very nice with high quality treadmill and good elliptical plus a weight machine. It was a little noisy on the weekend evenings but was quite at night. The staff was very welcoming and friendly. And hey - there is a huge lingerie and toy store right next door. Old hotel, but the staff were extremely helpful and friendly! Beds and pillows were comfortable. They had a decent selection of breakfast items and free wi-fi. Overall a very pleasant experience! I had very low expectations coming in but I was pleasantly surprised. Your staff are excellent, helpful people. Special thanks to Marisol Corralejo. She's the best. When we realized we'd left a souvenir T-shirt in the room when we checked out on 3/24, we called the hotel. Marisol found it for us, packaged it, and mailed it back to us. We'll definitely recommend the hotel and will stay there again. Free wi-fi worked very well. 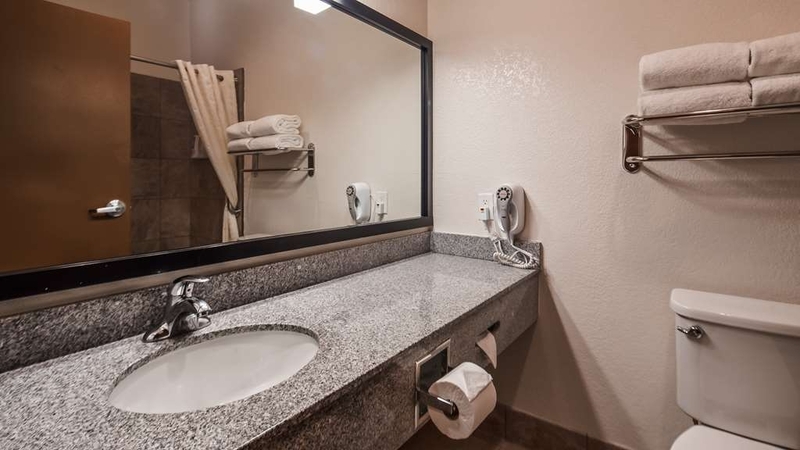 "Arizona Hotels leave lot to be desired"
For Arizona it is one of the better hotels, new, clean and good staff. Hotels and Motels in Arizona tend to be beat up due to the weather and for the most part very plain. The lady preparing the breakfast was very helpful, clean and kept all the breakfast items full and fresh. My wife became ill the morning we were scheduled to leave. The staff was fantastic expressing care and concern. This above what I would describe as friendly and accommodating. I would definitely return and recommend this hotel to family and friends. The hotel was clean and in a good location. The parking situation was less than desirable. Not enough spaces for guests. We couldn't figure out how to access the pool area and no signage to explain. I called the front desk and the clerk was somewhat irritated with my question. This hotel was very easy to find and get to. Just within a 10 minute drive of our baseball park that we were visiting! We loved the hotel. Had a wonderful breakfast, very attentive ladies working the breakfast area willing to get you whatever you need. We didn't get a room with a sofa and the hotel provided us with a roll away bed at no extra charge. Lovely people working the front desk willing to make sure we had the best stay possible. "Unspectacular hotel, spectacularly nice staff"
A basic hotel, generic and unspectacular compared to other area Best Westerns that have had distincitve refurbishing, this hotel has an across-the-board friendly and pleasant staff going for it. It is well-priced for the business traveller and for the Spring Training fan, and is easily accessed from most of the West Valley. 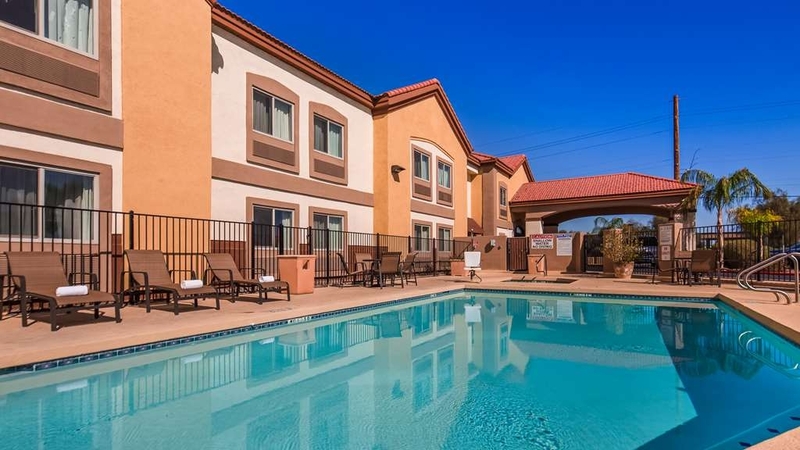 It is on the edge of Tolleson, a hollowed out former agricultural town that now seems dominated by big box stores and storage units, so there's little to do around the hotel, but again, you can get to just about everyplace from it if you have a car. Needs to be upgraded, but I'd stay again for the bargain and the staff. We stayed at the Best Western during Spring Training and it is very convenient to expressways and White Sox park The price was very reasonable, breakfast was ok, scrambled eggs were tasteless, but the sausage and bacon and waffles were good. The outdoor pool was small but the whirlpool was very nice. The room was clean and neat but, could use some updating. The room was large and the beds were comfortable. There was a small table, microwave and refrigerator. There was also a small coffee pot. The staff was very friendly and helpful. The hair dryer in the bathroom smoked and was not working, but the front desk supplied a new hair dryer quickly. One day our bed was not made up and there were no towels when we got back to the room at 5pm and had to ask to get our room done. They have motion sensors in the bathroom and hall which wake you up if your room mate goes to the bathroom. Could not turn off sensors. The halls were dark. I would stay here again but the property could use some TLC. Forgot to mention that this is a non smoking hotel and all the rooms are non smoking Really nice. WiFi was free but so slow I did not use it. This could be improved. "Good value but in need of freshening"
I stay at many Best Westerns and am really impressed with the new properties and the redo on some of the older properties. This is a good hotel but could use a renovation and freshening. Our room was reasonably clean but somewhat tired and stale. The hall carpets are old but reasonably clean. The breakfast was real good and replenished every day. In fact one day they were out of bananas and the nice lady that runs it Dianna actually went out in her car to buy bananas went we pointed it out. Outstanding customer service. Same for two other people - Dan and Marisol. They have sensors on the hall and bathroom lights that illuminate when motion activates them. Great feature unless you are up 5-6 times at night on a restroom break and the lights come on. Dan came up with an idea to "duct tape" the sensors. It worked - Red Green would have been proud. The washing machine was broken for 5 days - not a good sign of customer service commitment by owners. All in all good value but getting tired. Owners need to,spend some capital dollars or the property will soon be branded with one of the less desirable banners. "Generally fine, but we had a security issue"
We use Best Western for most of our travels, about every 2-3 months. We booked and stayed 7 nights at this property. One evening, came back to room after being out all day to find our door ajar. Nothing missing or out of order, but it was cause for concern. Also had a couple of minor annoyances with being short on towels one day and not getting maid service at all another day. The property is neat and clean, and staff were generally fine. The breakfast attendant during the week was especially cheerful and on-the-ball. It was nice, a good breakfast. It was clean and spacious. The staff was helpful and friendly. We came in very late and left early but it was comfortable and what we needed. We didn't use the pool but it looked nice. "In need of a New GM"
Worst person, checked out early from the fear of this man, he not only yelled and degraded his help in front of hotel guests,the gm pulled us aside and threatened to kick us out for feeling bad for his help,never again will i or our group ever set foot in this hotel,as long as this gm is employed with any BestWestern in the united state. In my lifetime i have never experienced a human person like this. We have contacted the corporate office for a phone call, I left this hotel literally shaking and throwing up from our stay. "New gm just a horrible person"
"Nice place, friendly helpful hotel staff"
"Here for Cheer event at AZ fairgrounds"
We arrived around 7 pm. Front desk could not find my reservation at first (2 young people running the place). They sent me on a goose chase to get in and find our room. The door by the elevators would not open with the key, so we had to move the car and drag our luggage to the 2nd floor. Lots of noise that night next door as a huge party was broken up by police. Toilet backed up, phones in room did not work, and over charged at checkout, which was corrected by manager. On the plus side: people at front desk were nice, breakfast was adequate and room was large and comfortable. Please Best Western, give this place some very necessary attention. "Enjoyed our stay for national championship!!" I booked four rooms for the national championship football game. Evie from the hotel called me ahead of time to make sure our reservations were what we wanted and even preassigned my rooms. The hotel staff were very helpful. They are replacing door locks to solve problems with door locks. The beds were very comfortable and the rooms were large with a refrigerator and microwave which was nice. I was on the back side of the hotel and heard very little noise. The breakfast was included in the price of the room. Thanks again for all you did for my SC family on our recent stay. "Sensored lights in room went on and off all night"
The Hallway door light has a sensor. Both nights we were there the sensor would go on and the light would go on then the light would go off, This happened very often. The second night I found a piece of tape to put over the sensor button but it didn't work so the lights again went on and off ALL night lone. At check out when I mentioned the light issue the staff told me that she hears that happened to other quest as well. REALLY! I pay to stay there to get a good night sleep, it was the worst night sleep ever at a Best Western. arrived at noon from a long flight to find they wouldn't check us in til 2 or pay $20. we decided to go to Gus's for lunch .. what a treat. great place. The room was fine had all required but returning from being out all day came back to our door being left open. Nothing was taken but was a little unnerving. Desk clerk staff in desperate need of basic customer service principles. Customer service training should be this motel's first priority. I can't imagine staying here again unless I know the management of the property has changed. Checked in at 9:30pm and checked out at 7am the next day. Outdated hotel and overpriced, but didn't have many options of where to stay as there was an event going on nearby so a lot of hotels were booked. The front desk was friendly and personable. I did not find out until a few days later when I checked my credit card statement I was charged an extra $5. When I called the hotel they told me I had "stained" a face towel. Apparently some foundation makeup may have been on the towel, but ALL of my makeup is WASHABLE, therefore that would NOT be a stain. Very disappointed that I was charged this bogus fee. I know it is only $5, but it is the principle of the matter. Will never stay in a Best Western again or recommend to anyone. "Needed a place to stop and we got it." I will try to offer my experience of our short time at this hotel. We arrived at something like 2am looking for a place to stay for a few hours. I have had good experiences with Best Western in the past and we decided to stop here. The staff were extremely friendly, and even adjusted our room rate since we would only be there for a short time. The wi-fi worked great, the room was comfortable and clean too. Honestly, we got what we expected, and that was great for us. The hotel is easy to get to from the freeway and I am sure it will be on our list of places to stay at in the future if we find ourselves driving through late at night again. This property is very tired and needs some heavy duty cleaning and updating. There is nothing really special about it. For the money, it was a below average stay. I have stayed in other Best Western's around the country, and even in other countries (Italy). The brand, frankly, has suffered over the past decade or so. For the money, I would pay extra to stay in a Courtyard by Marriott or Hampton Inn. I learned my lesson. "Should'nt be part of Best Western"
Bed linen was badly creased, looked like it had'nt been laundered. Staff would note even look at it. TV Remote was missing, staff replied that not all rooms had a remote. Eventually found one for us. Desk attendant eating fast food at the desk when we decided to cancel the second night and leave immediately, before the first night. I've stayed at many Best Western hotels during my 38 day trip, this was unquestionably the worst in all aspects. I will be pursuing the Best Western head office for a refund on my $100 for the night I did'nt have there. "2 night stay to visit Family"
Checked in on Thursday pm and the staff was nice and helpful, on the way to the room the hallways smelled old, once we got to our room it looked fine and was not a four star hotel but we noticed a few of the pillow cases were dirty and one had hairs on it. The front desk was quick to change them out for us. After that I went to the restroom to was my hands and one of the wash clothes was dirty but had been folded up as it was clean. At that point I was grossed out with my stay in the room. The Hotel did have continental breakfast that was good and the staff was defiantly friendly. "Excellent Customer Service, feel like part of the family!" I wish every manager would be like Sal (Hotel Manager), she was awesome, called her a week before my check in for having kids requiring car seats on the shuttle services and when I got there, everything was set and arranged. Cerise was super kind and helpful, always a smile for us. Kevin, oh man Kevin, great guy, walked the extra mile for us, we were 9 people and he was awesome. Thank you guys for everything ! Definitely I would stay there again and recommend you guys ! "2 day stay at BW"
Overall excellent, clean and comfortable, professional and friendly staff. Sal and Cerise demonstrated professional courtesies and made everyone feel welcome. Outstanding stay. I would stay there anytime. "Great rate through usaa but the experience wasn't great"
We arrived late after a sporting event and the woman checking us in was more worried to tell us about the no smoking policy and fine rather than giving us vital information such as WiFi password and breakfast time. I even told her that smoking wasn't a problem being that we don't smoke but yet she still felt the need to reiterate it 2 more times. The TV didn't work. We tried fixing it but unplugging cables but direct TV kept saying no signal. All I wanted from this stay was a comfortable night of sleep without any frustrations. And as advertised, WiFi and TV are a big part of comfortable stay at hotels nowadays. Two starts for great rate but other than that I'm not satisfied with best western. My friends and I were attending a concert less than a mile from this hotel. This Best Western was not the nicest Best Western I have ever stayed at but Sal (Hotel Manager) was fantastic. I will be staying there again because of her customer service. We loved the room size, very large. The staff was very professional and happy. We were very tired coming from California and they had the rooms very clean and cool. We were able to get adjoining rooms for our family and we had a great time. It made our trip more pleasant. Would recommend them to everyone. Oh the price was Great Too! My husband was very happy to get there in time to watch the football game. Great place to stay if you are going to a concert at Ak-Chin Pavillion. They have a shuttle that will drop you off and pick you up for the concert. They rooms were nice and spacious as was the bathroom. Staff were very friendly and helpful. "Not a Bad Stay for a Couple Nights"
My wife and I were visiting for the weekend to see family in Glendale and to attend the Cardinals game. WHAT'S GOOD Being on McDowell Rd is convenient to get to restaurants and other services nearby. The hotel was simple but clean and the rooms were very quiet. The hotel does offer a hot continental breakfast which was basic but worked. As far as the room it was simple, quiet and the bed was comfortable. WHAT'S NOT SO GOOD The beds have these rather strange square little pillows so it's a bit tough when you are sleeping and you roll off the little pillows. Also the hotel is in an area that I wouldn't recommend walking around at night. It's also a bit strange that they have a pool and hot tub that is basically in the parking lot near the main entrance. Overall, it was a decent stay for a good price.